Established in 1850, the University of Utah, also known as the U of U or simply the U, is a Tier I research university located in Salt Lake City, Utah. Set in the foothills of the Wasatch Mountain range it has a vantage point like no other. Only minutes away from rugged mountain bike trails, fancy ski resorts or all the amenities of downtown Salt Lake, the U has something to offer for everyone. Its student population of approximately 30,000 people can choose from a very diverse college curriculum. The U offers approximately 100 undergraduate majors and 90 graduate degree programs and has an approximate annual endowment of a little over $500 million. The University of Utah ranks #1 in the nation at creating startup companies based on student and faculty research. Forbes Magazine ranked The U #15 public university in the United States. And in 2011 the ARWU ranked it #79 in the world, while The Times rewarded it the 83rd world ranking. The U gained significant notoriety over the years. It was one of the original 4 nodes of the ARPANET, a predecessor of the current worldwide internet. It gained further recognition when it developed and administered the world’s first artificial heart in 1982. The U of U has produced 3 Nobel Prize winners, with two of those coming in the last few years. In 2007 Mario Capecchi won the Nobel Prize for Physiology/Medicine. Venkatraman Ramakrishnan in 2009 was awarded the Nobel Prize in Chemistry. * In 2005, Utah became the first, and so far only, school to produce the #1 overall pick in both the NFL and NBA Draft in the same year. In 2004, the University of Utah football team became the first, original BCS busters by going undefeated and winning the Fiesta Bowl. In 2009, the Utes repeated as BCS busters by beating Alabama in the Sugar Bowl, finishing 13-0 and #2 in the nation. Besides a very successful football team, the U has always been known as a ‘basketball school,’ having won the 1944 NCAA title, the 1947 NIT crown and runners up in the 1998 NCAA tournament. It has made 4 Final Four appearances and has the 9th most wins amongst college basketball programs. 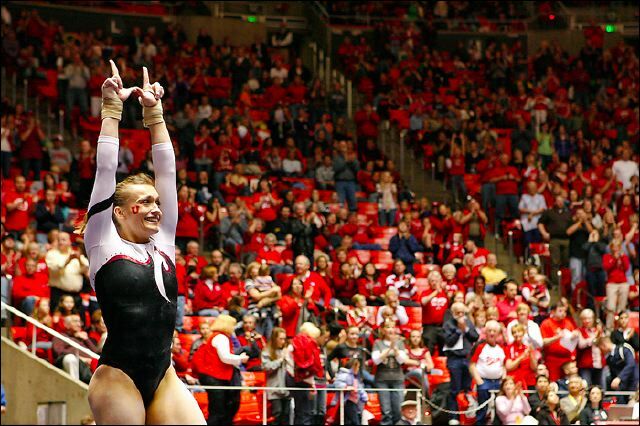 The women’s gymnastics team, the Red Rocks, have won an amazing 10 national championships. It is the only program to have qualified for all 25 NCAA Championships and has won the NCAA gymnastics attendance race 22 of the last 25 years. In 2010 it became the first team other than basketball to win the NCAA Women’s Attendance Race, averaging more than 14,000 spectators for each of their home meets. The Utes’ men’s tennis teams remains one of the most successful teams on campus having won at least 24 team conference championships and 1 NCAA Singles Champion. In 2003, the Utes’ ski team won its 10th national championship reaffirming the state’s love affair with the winter sports. The U was the center of the world of sports in 2002 as Salt Lake City was the host of the XIX Winter Olympic Games. Rice Eccles Stadium, home of the Utes, hosted the opening and closing ceremonies.